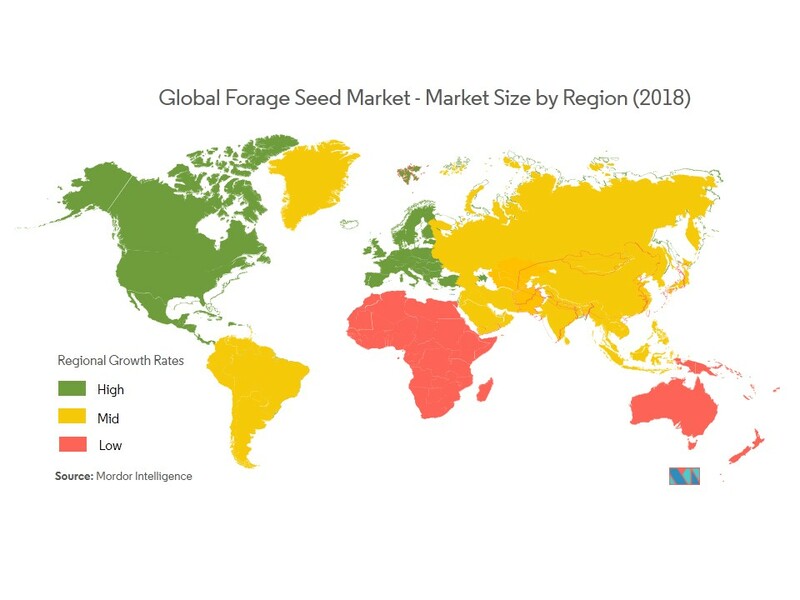 The Forage Seed Market is segmented by Crop Type (Cereals, Legumes, and Grasses), Product Type (Stored Forage, Silage, Hay, and Fresh Forage), Animal Type (Ruminant, Swine, Poultry, and Other Animal Types), and Geography (North America, Europe, Asia-Pacific, South America, and Africa). 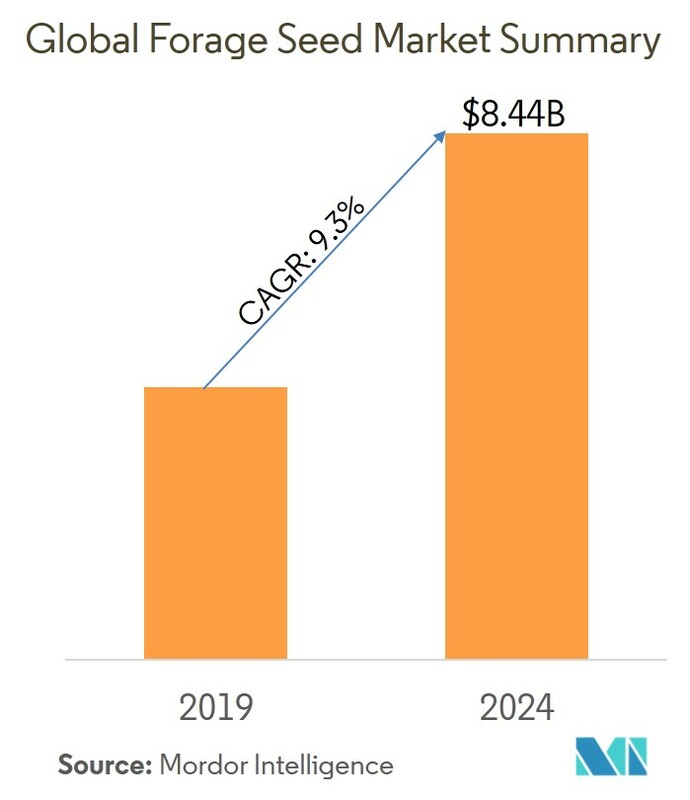 The forage seed market was valued at USD 4.96 billion in 2018, and it is expected to register a CAGR of 9.3%, during the forecast period (2019-2024). 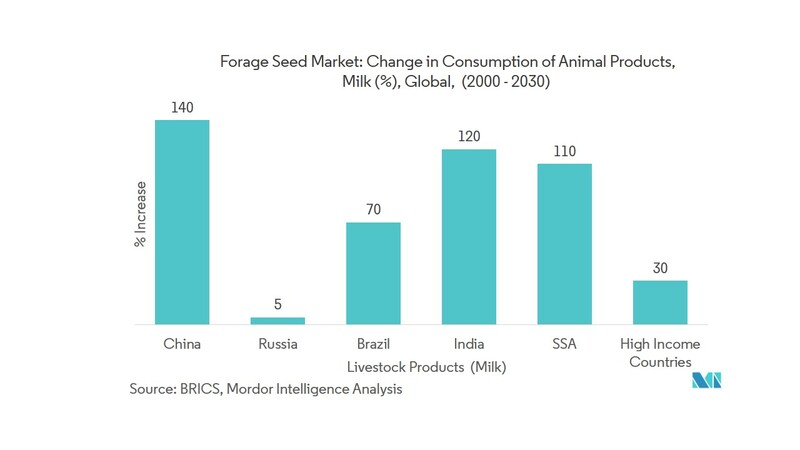 The major share in the forage seed market is occupied by North America, followed by Europe, Asia-Pacific, South America, and Africa. The major factors driving the forage seed market are the increasing demand for dairy products, the increasing demand for animal products, consumer preference for organic food and feed products, shrinkage of open land for animal grazing, and increasing specialized feed requirement due to the introduction of high yielding cattle. Some of the restraints identified in the studied market are adverse climatic conditions, time-based incentive returns requiring significant investments, and the unwillingness of farmers to pay for high-quality forage seeds. Forages are plants or parts of plants eaten by herbivorous animals. The report covers the seed market of forage crops, and analysis of different types of forages, and their prospects in different geographical regions. The factors affecting the studied market, either positively or negatively, and competitiveness among global leaders are also included in the report. The report contains a detailed analysis of various parameters of the forage seed market. The market studied has been segmented, based on crop type, product type, animal type, and geography. Livestock is a major factor responsible for the growth of the agricultural sector. The world food economy is being increasingly driven by the shift in diet and food consumption patterns toward livestock products. In the future, production is anticipated to be increasingly affected by competition for natural resources, particularly land and water, and competition between food and feed. Developments in breeding, nutrition, and animal health may continue to contribute to the increasing potential for efficient production of animals. The growth in livestock production is likely to create a demand for better forage crops, as people are exceedingly concerned about the quality of meat they consume. The growth in the demand for forage crops can only be supported with better quality forage seeds. Currently, North America is the largest forage seed market. Alfalfa is the largest traded seed among all the categories, and in the United States alone, it accounts for 27% of the market value. Currently, the United States occupies the largest market share (48%). Favorable weather conditions and an ever-increasing domestic and international demand are driving the growth in the North American forage seed market. Weather in the North American region is a major reason behind the decline of demand in the forage seed market. To counter this effect, in December 2017, Grassland Oregon, a seed company based in Salem, Oregon, launched FIXatioN Balansa and Frosty Berseem clovers, making them available to producers in Canada. Both varieties are capable of withstanding temperatures as cold as -26°C and -5°C, respectively. 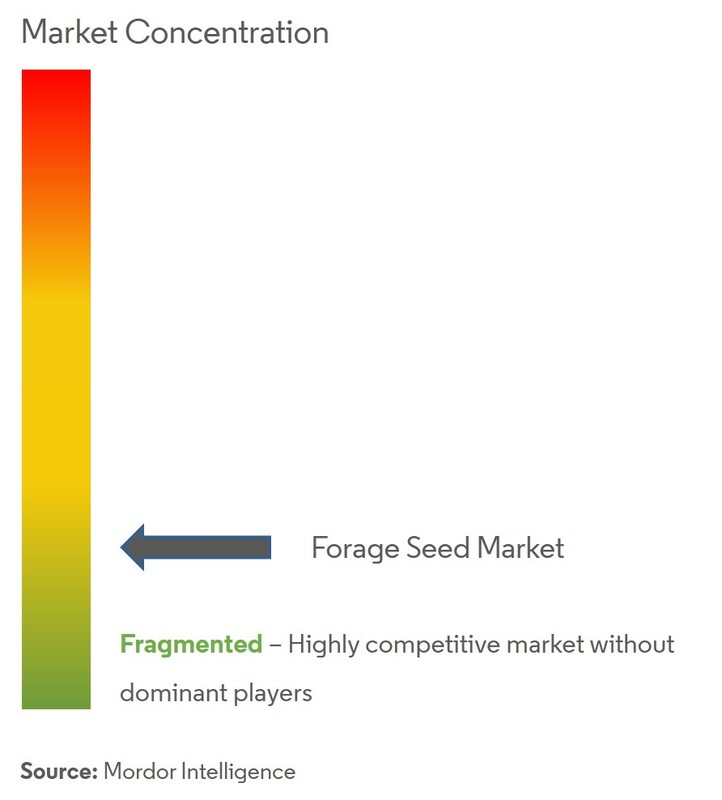 In the forage seed market, companies are not only competing based on product quality and promotion, but also focused on strategic moves to hold larger market shares. Major acquisitions are taking place between companies to expand the forage seed business. One such acquisition has been witnessed between AgReliant Genetics and Golden Acres Genetics. The players in the market are investing heavily in this market, in order to develop new products. 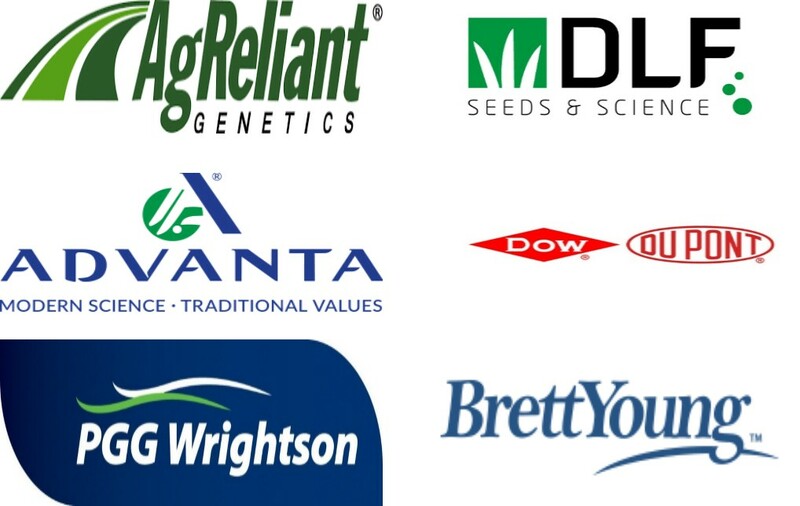 Dairyland Seeds, which is a part of DowDuPont, introduced 7 new products under its forage seed category for the 2018 planting season. The highlights for these new products are the new genetics and expanded trait packages giving them an edge above their competitors. 6.3.7 Hancock Farm & Seeds Co.